This pongal was the first thing I put in my mouth and it made me think that the meal had potential. It wasn’t anything to write home about but it was in the ballpark of what it should be (though the carrots and peas seemed like they might have been dropped in directly from a frozen bag). However, reality established itself harshly with this sad, cold iddli. If these vadas had been fresh they might have been very good; as it is, they were lukewarm and were barely acceptable. The sambhar (in back) was less than acceptable. The rasam (I think—it was much thicker than rasam should be) was okay. These are the sad dosas that were first sent out. They came out suspiciously quick, were barely warm and collapsed almost immediately. …shattered when touched, like so much glass, revealing about a tablespoon and half of filling in the center. This cabbage poriyal was the one thing I ate that I could be convinced to say was better than average. However, for some reason it was billed on the buffet as lemon rice. There was no actual lemon rice anywhere in the buffet. At least I hope this was not intended to be lemon rice. I think it was a veg biryani. If so, you could probably make a better biryani, never having tasted any biryani before, using the instructions on the back of a biryani masala box. This gajar (carrot) halwa might have been decent if they’d used 70% less sugar. All of this came to $65 with tax and not particularly generous tip and it was about $40 more than I would have been happy paying for this. In addition to what’s pictured there were maybe two or three other dishes: one very strange looking alu-matar, which I did not touch but which caused our friend to make a strange expression when he tasted it; there was also that most traditional of all South Indian dishes, paneer tikka masala; I don’t remember anything else though there may have been something. Though we did not waste much of our food, not one of us got up to get seconds of anything. The best I can say is that none of what we ate tasted actively bad/nasty—none of it was unpalatable. It’s just that all of it was mediocre and dull at best and that any restaurant should aspire to more than “not unpalatable” at any time of day that they’re open. Frankly, I don’t care that it was a lunch buffet: no place claiming to specialize in dosas etc. should ever send out such sad dosas or serve cold iddlies and lukewarm vadas with watery coconut chutney. It’s a bit of a mystery to us how this place is open (and possibly thriving–though there were not very many people there that day) while Nalapak, which used to be a few miles south on Central Avenue, closed. We thought Nalapak was average when we ate there (on a couple of occasions) but compared to Dosa King they were the French Laundry of South Indian food. It’s possible, I suppose, that Dosa King has had a recent change of ownership. There were only two people in the front of the house and neither were Indian (as far as I could make out), and neither seemed to really know the food (they also didn’t seem to know how to operate the cash register). There was reference to a “he” cooking in the back but there was almost no sound emanating from the kitchen. The two women were not happy with me for sending the dosas back and made a huge deal when I was paying at front of asking another bunch of customers—an Indian family—if they had liked the dosas and found them too soggy etc. The man said that everything was good, and one of the women looked at me meaningfully and said, “maybe you just had bad luck with your dosas”. I wanted to say “maybe they’re just being polite, maybe they have low standards, maybe they’ve not had very many more dosas than you” but instead I smiled politely. It gives me no pleasure to pan this place: someone owns it and may possibly take pride in it; but passing over bad meals in silence doesn’t seem like a good idea either. But if you’ve eaten here recently (whether at lunch or dinner) and had a very different experience do write in below. Anyway, I’m going to need to find some people willing to accompany me to Malabari Kitchen for the next installment in this saga. And I’m afraid if that meal is a fiasco as well I’m going to be bringing this experiment to a close. I’m a glutton but not for punishment. 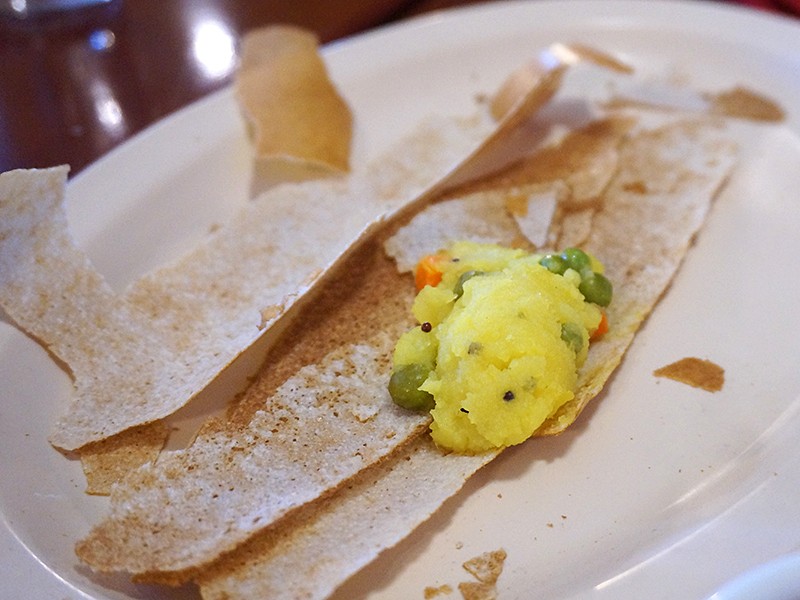 This entry was posted in *Food, Minnesota and tagged Dosas, Indian Cuisine, South Indian, Twin Cities Indian. Bookmark the permalink. Too bad. I usually get excited by idlis and dosas on the menu.